VELCHERU NARAYANA RAO is Visiting Distinguished Professor of South Asian Studies at Emory University. Profile page. DAVID SHULMAN is Renee Lang Professor of Humanistic Studies at the Hebrew University of Jerusalem. Profile page. 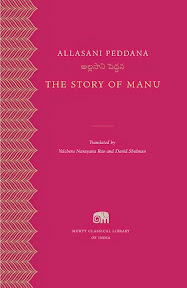 Allasāni Peddana, Velcheru Narayana Rao, David Shulman (2015). The Story of Manu. Murty Classical Library of India; 4. xlv, 602 S.